If electric cars have any future in the United States, this may be the city where they arrive first. Utilities are gearing up to cooperate with the automakers, a first for the two industries, and governments on the West Coast are focusing intently on the coming issues. Price and tax incentives need to be worked out. Locations must be found for charging stations. And local electrical grids may need reinforcement. The California Public Utilities Commission, whose headquarters are in San Francisco, has brought together utilities, automakers and charging station companies in an urgent effort to write the new rules of the road. Much of the attention on electric cars has been on the vehicles’ design, cost and performance. But success or failure could turn on more mundane matters, like the time it takes car buyers to navigate a municipal bureaucracy to have charging stations installed in their homes. When the president of the California Public Utilities Commission, Michael R. Peevey, leased an electric Mini Cooper, he said, it took six weeks of visits by installers and inspectors before he could plug in his new car at home. “It was really drawn out and frustrating and certainly is not workable on a mass basis,” Mr. Peevey said. Such issues are being hashed out here first. The San Francisco area is home not only to a population of early technology adopters but to companies like Coulomb Technologies and Better Place that are developing the networks and software to allow utilities to manage how cars are charged. Tesla Motors, a Silicon Valley company that makes electric cars, says it has already sold 150 of its $109,000 Roadsters in the Bay Area. One customer bought the sleek sports car on the spot after a test drive. In Berkeley, a town known for its environmental sensibility, one out of five cars sold today is a hybrid Prius. If electric cars are adopted that broadly in the next few years, problems could ensue. “If you just allow willy-nilly random charging, are we going to have neighborhood blackouts?” asked Mr. Tang, the utility executive. He said a single car could consume three times as much electricity as a typical San Francisco home. Mr. Tang is working to make sure that does not happen by monitoring where electric cars are sold in Northern California. And later this year P.G.&E. 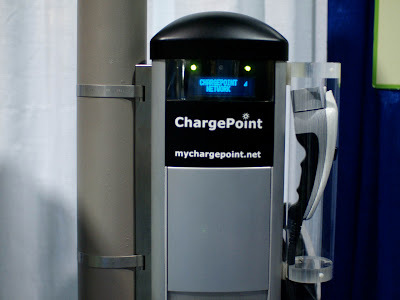 will lead a “smart charging” pilot project, connecting 200 cars to special charging stations that let utilities control the electrical demand at a given moment.